When you unlock the door using the lock tab on the driver's door, only the driver's door will unlock. Pull the front door inner handle. uThe door unlocks and opens in one motion. 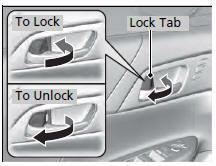 Unlocking and opening the driver’s door from the inner handle unlocks all the other doors. To avoid all the doors to be unlocked, use the lock tab on the driver’s door to unlock, then lock again before opening the door. uThis setting works for one time only. If you do not want all the doors to be unlocked all the time, customize the Auto Door Unlock setting to Off using the multi-information display* or audio/information screen. 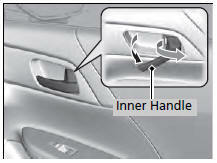 The inner front door handles are designed to allow front seat occupants to open the door in one motion. However this feature requires that front seat occupants never pull a front door inner handle while the vehicle is in motion. Children should always ride in a rear seat where childproof door locks are provided. 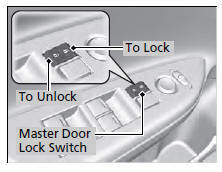 Press the master door lock switch in as shown to lock or unlock all doors. When you lock/unlock the driver's door using the master lock switch, all the other doors lock/unlock at the same time.